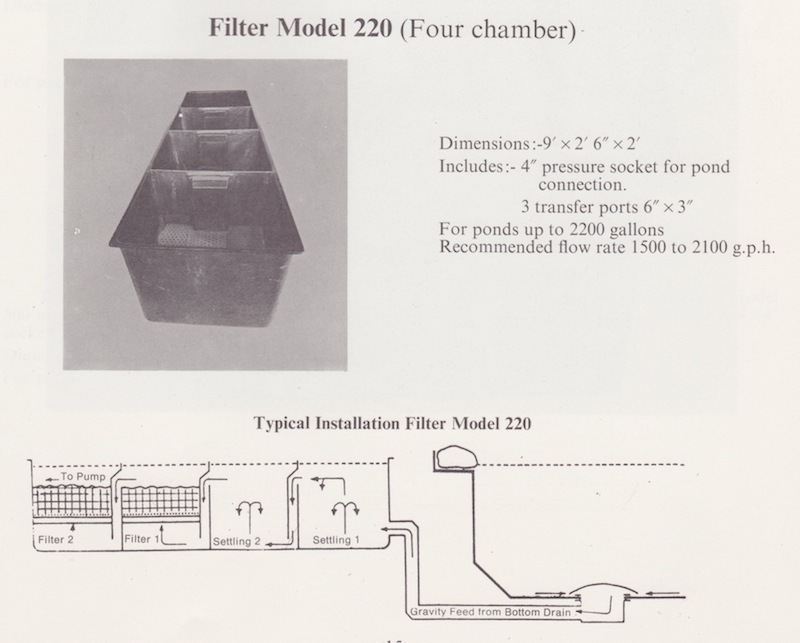 Over many years I have bumbled and fumbled about with many forms of what I considered to be ‘filter units for Koi ponds’. In ’72 being totally wet behind the ears I was completely convinced that the sponge prior to the impeller of my Otter Cub pump was all the filtration my Koi and my eye would ever need. The first attempts at Koi pond filters were as a direct result of aquarium technology, which was the only thing Koi keepers had at the time and as a result ‘under-gravel filtration’ became the order of the day for those of us ‘in the know’. ‘Tracking’ – wot’s that then? No one even gave a thought to that word because assumption was the order of the day and, more importantly, the quest to find gravel that was ‘sharper’ than the others became the Holy Grail for ‘us in the know’. In truth gravel was the only medium we could find to pass our pond water through at the time. Whilst there were a few ‘boffins’ of the day who tried to explain to me the advantages of having more ‘surface area’ on a particular type of stone, I always quite stupidly assumed that they were saying this because it would trap more sh.1t and thus my pond water would become much clearer. The only single thing that mattered in those days was clarity and that’s how all Koi ponds were judged when we were lucky enough to board a coach and spend our Sundays looking at Koi in the ponds built and owned by fellow members of the BKKS. To resolve the issue of clarity in my case, I was one of the first to purchase the new miracle, which was a 30” diameter Lacron sand filter on the recommendation of the rich members of the society. Being a somewhat superstitious sort I reckoned the safest way was to hook the suction inlet of the unit directly to the outlet of my huge under-gravel filter then served by the finest gravel (costly Canterbury Spar) and thus get the best of both worlds. Assumption once again reared its head in my case here, I reckoned that by having larger pieces of gravel in my under-gravel (Spar) in the pond and smaller pieces of gravel (sand) in the sand filter, I’d at last be onto something very special. This foregone conclusion was actually proven to me only one day after installation of my very expensive sand filter when my pond water appeared to have vanished and my Koi appeared to be floating on air despite the fact that I was paying for and using a pump that consumed more electricity than my entire house. It was my wonderful sand filter that put me on the road to being a complete Koi snob in ‘75 and I found it difficult to converse with those stupid enough not to own one and never even considered the time spent and the water dumped when the pressure gauge and the screaming of the motor all too often demanded an urgent backwash. It was after that I heard some smartass come up with the term pH and fell about laughing. Some months later when I heard the terms nitrite and nitrate I honestly thought one of them was a spelling mistake! No time for tracking when some other smartass has now introduced the bloody word ‘ammonia’! My first visit to Japan in ’77 did nothing to teach me a thing about pond filtration because all the systems seen over there were a series of huge concrete boxes and the only people who messed about with concrete in the UK were house builders – and house builders back then charged fortunes for their secret talents that were always kept to be close secrets within their trade. Only the filthy rich ever considered concrete ponds and concrete filters back then. 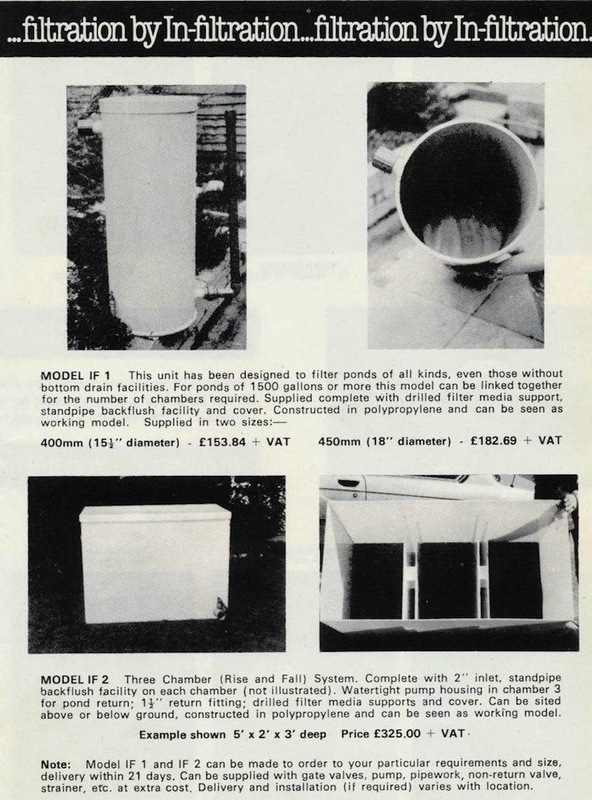 I finally sold my precious sand filter in ’78 and can still recall the stench of 75 kilos of ‘sand’ we had to remove by teacups before we could actually lift and carry the unit away. In ’79 I decided by then I had much more than enough expertise to take the UK Koi keeping hobby by storm and soon after came up with these two earth-shattering masterpieces. The single tube masterpiece at the top of the page (Model IF1 to those in the know) had water pumped from the pond into the base of the tube where it met a devilishly clever void of absolute nothingness before rising upwards a further 15” to meet a perforated tray that supported an 18” depth of Canterbury Spar gravel above it. The logic behind all this was that the larger bits of sh.1t would remain in the void below the gravel and these could be removed periodically by the turn of a very costly 1” double union ball valve. In fact a simple demonstration of this futuristic valve and the water firing out of the tube was enough to convince everyone watching that the filter was a true masterpiece. The next stage was to pass the rising water upwards through the 18” depth of solid gravel that could not possibly allow a single bit of sh.1t, no matter how tiny, for the clean and filtered water to reach the top of the unit and then fall back down to the pond through the 2” bore open outlet. Actually and on serious reflection, that narrow tube was a FAR better way of getting incoming water to come into contact with media surfaces and then track to the 2” exit, than the larger round and square boxes that were to appear later – just think about it! As to my flagship model of the day – namely the illustrious IF2 that was tailored only for local billionaires at the time, well this was sheer science and technology gone mad. The hallowed IF2 was the very first commercially made ‘rise and fall’ multi-chamber pond filter on this planet! If you look closely at the gap between the two internal walls this channel was where water passed from the top of one chamber and down into the base of the next to rise upwards and then fall again. I’ve often wondered why I never received the Queen’s award for industry for this magnificent item? That aside, the multi-chamber ‘rise and fall’ method was the be-all and end-all as far as I was concerned for many years to come. By ’83 I was singing the praises of the same units formed in revolutionary GRP and also please note well the equally revolutionary gravity-feed from the pond drain that most considered to be both outrageous and completely extravagant to boot! Copies of these units are still being produced and sold today by Kockney Koi. Apply that to vortex units and all other upward-flow boxes one can name and the painful truth of it all is that they are absolutely naff in their ability to get incoming water to pass the majority of media surfaces within the box. Well for one thing ‘tracking’ (in filters) should not be confused with ‘diffusion’. Microscopic dyes easily diffuse to stain an entire box whilst the tracking passes by completely undisturbed. Well, by now I think we are all mature enough to recognise what ‘tracking’ IS – whether we wish to consider it important enough to give it a second thought is also another matter. Then there are those who consider it to be of no importance whatsoever. ‘Tracking’ is a derogatory term, basically for Koi pond filtration purposes it translates as ‘no good’ or ‘naff’ – in truth we don’t want ANY tracking at all if possible thank you. – then just perhaps some different views and different opinions may emerge? From my own personal viewpoint and for whatever it’s worth, ‘tracking’ is THE MAJOR REASON as to why the vast majority of problems occur in Koi ponds all over the world. AND THAT’S EXACTLY WHAT ‘TRACKING’ IS! If you want to know more about tracking and water flow patterns, please click here to read.